Ebola has re-emerged in Africa in the DRC. Around 60 people are now thought to be affected, although not all are laboratory confirmed, resulting in over 20 deaths so far. The WHO have deployed 123 personnel who together with other agencies and local workers, will trace the contacts of the patients – this group is at the highest risk of becoming infected and could further fuel the Ebola epidemic. Eight thousand doses of the Ebola vaccine V920 are earmarked for these contacts, and also for the healthcare workers who will treat the infected patients. Although this is clearly an important emerging situation which has received early attention from the WHO, the situation has been deemed not to be a ‘Public Health Emergency of International Concern’ as yet. Despite this, measures are in place to reduce the chance of escalation of the outbreak, including exit screening at both sea ports and airports to lessen the possibility of the transmission of Ebola to further countries. Whilst this is the ninth time that the devastating infection has occurred in the DRC, many of the issues with controlling past epidemics persist. 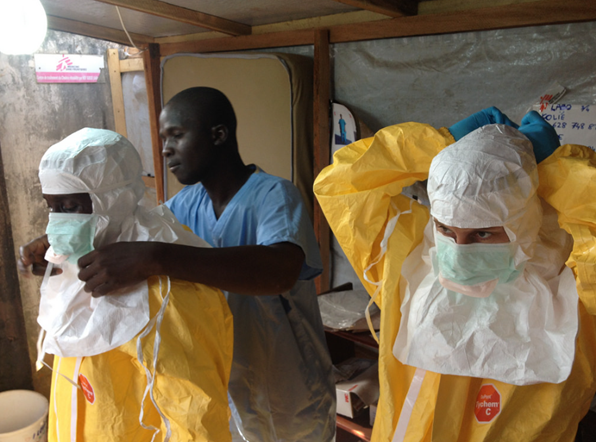 For example, although it is early in the outbreak, there are already reports of distrust of healthcare officials and resistance to outside aid: one medical team was threatened by locals when it was feared that the healthcare workers themselves were responsible for the Ebola outbreak, and another group of medical workers were prevented from testing an individual who was thought to have died from Ebola. Furthermore, two patients who had been quarantined to prevent further infection of others, recently ‘escaped’ back to their hometowns. One attended a church service and came into close contact with congregants while receiving prayers; the other travelled to their home and may have infected others in their village. Both passed away within a day. In addition, as with previous outbreaks, local funeral practices may have already played a role in the early transmission of the disease: a funeral of an Ebola patient in Bikoro is thought to have been responsible for the infection of some of those attending, who subsequently journeyed to the much larger city of Mbandaka. At first glance, it is difficult to understand why the same harmful practices and problematic responses to Ebola persist from outbreak to outbreak, when this often-fatal disease has resurged several times in the DRC. Ebola has not occurred in this particular region of the DRC before, however: for them it is a new occurrence. As DRC is one of the largest countries in the world – a country of generally very poor infrastructure, making travel difficult – the previous outbreaks of Ebola may not have affected Bikoro and surrounding regions, highlighting the need for education about the virus. Furthermore, resistance might be partially explained by the WHO and partners being seen as the outsider, or as representing the government which has often had a chequered relationship with local populations. In an attempt to counter these negative associations, during the present outbreak and also during the Ebola vaccine trials in Guinea, the WHO have used local ‘social mobilisers’ to introduce the healthcare teams to rural village leaders so that trust can be established. This approach has had mixed success, however. When healthcare interventions seek to change more fundamental aspects of how local populations see themselves, particular challenges can be faced. For example, attempts to control the transmission of Ebola by providing hygienic burials can have ramifications for the local population of which we in more developed countries, are unaware. Whilst witnessing burial rites first-hand in rural Guinea, Prof. Fairhead from Sussex University, UK, saw that when mothers and their children die at the same time, they are never buried together in the same grave. In the view of the local people, that would have threatened the safe passage of the mother to the afterlife, and also affected the ‘reproductive order’ for all women. Furthermore, if the first child of any couple were to die, the child should be buried in a special site at the edge of the village, swaddled in the leaves of the medicinal plant Newbouldia laevis. In this way, the locals believed that they were facilitating the return of the child to the land spirit. Given these fundamental beliefs, it can easily be imagined that when healthcare agencies, with the best intentions, enforce hygienic burials to stop the transmission of Ebola, significant harm can occur to the belief system of the local population, unwittingly inviting resistance. It is worth noting that as these beliefs are so important, a return to these traditional practices is almost assured following the end of an Ebola outbreak, enabling a subsequent epidemic should it occur. At present, the situation in DRC is under close surveillance and although the risk to surrounding countries is described as high, the global impact is low – and is very likely to remain so. It is advised that travelling to the affected area for business is postponed until the emerging Ebola outbreak is controlled.